Oakley SI Flak Jacket (Matte Blk/Grey) » Protective Solutions, Inc. FLAK JACKET™ is made of lightweight O MATTER® for all-day comfort. Pure PLUTONITE® lens material filters out 100% of all UV, and FLAK JACKET™ meets ANSI Z87.1 standards for impact protection. The semi-rimless design means there’s no frame rim to block downward view. Optical clarity exceeds all ANSI Z87.1 standards, and XYZ OPTICS® extends razor-sharp vision all the way to the lens periphery. 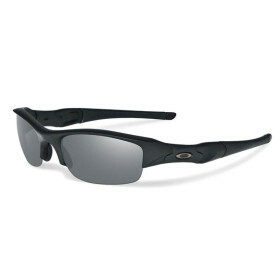 Protective sports-specific Oakley Soft Vault included. Maintains sharp, clear vision: FLAK JACKET™ features Oakley HYDROPHOBIC™, a permanent lens coating that prevents rain and sweat from building up on the lens. It also repels skin oils and other contaminates, so the lens is smudge resistant and easy to keep clean. It even eliminates static electricity, so dirt and dust particles won’t cling. Stays ahead of the sun: FLAK JACKET™ lets you change lenses in seconds to optimize vision in any sport environment. Multiple lens colors are available, and all lenses feature the unbeatable clarity of Oakley’s HIGH DEFINITION OPTICS® (HDO®). Offers a secure, custom fit: Choose the nose pads that give you the best fit — two sizes are included with every frame. Like the stem sleeves, they’re made of UNOBTAINIUM® to increase grip with perspiration. Oakley’s Three-Point Fit optimizes comfort and holds the lenses in precise optical alignment for superior clarity.